We're not the first generation to go through this, by any means. Yet with less than 1% of Americans currently serving in the military, it can sometimes feel that way. 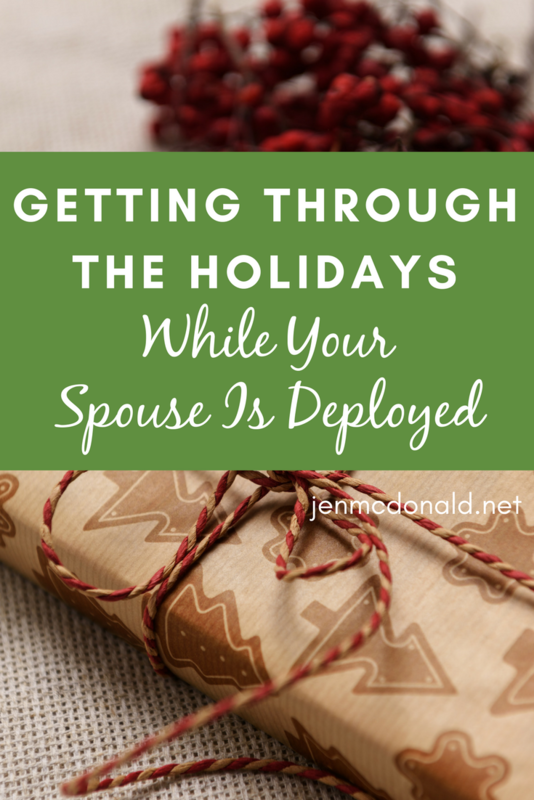 Military life can be very lonely and this is never more true than when you're facing the holidays with your husband or wife deployed, away for training, or on a remote assignment. I'm not certain that any words of mine will make it easier, other than the simple knowledge that someone else has been there and can completely understand what you're feeling as Christmas approaches and the holidays are in full swing all around you. During my husband's last deployment, I made the comment at the beginning of December that I'd like to roll myself in a blanket burrito, put my pillow over my head, and sleep until after January 1 so I didn't have to pretend I cared about Christmas or any of the normal things we always did. The ache of deployment that underlies every activity is intensified during the holidays, when every song, every well meant gesture, every gift seems to serve to remind you of your aloneness. Going to the kindergartener's holiday party alone. Attending your middle schooler's choir concert alone. Shopping, gift wrapping, setting up the tree...all of it: alone, alone, alone. Yet I knew, as much as I wanted to stay in my aloneness and just sit and feel all the sadness (Because not feeling it would somehow mean I didn't care about what my husband was going through--I'm not saying there's logic involved here), I had to muster up the strength to fake it, for my children's sake. This wasn't easy, or fun, and I had many moments of crying alone in the bathroom or giving vent to out of proportion weeping during a Hallmark movie marathon, but I got through it. And so will you. I promise. One little piece of advice I'd give: if you don't have someone at home to help spur you on to getting out of your house, enlist a friend who will talk you into doing some of the things you'd normally do like watch the town or military installation's Christmas tree lighting or even a little shopping. A few moments out may help you forget for a time. But the kicker is that--what YOU want to do. But above all, don't feel you have to be "on" for anyone's expectations (this is different to me than trying to make things better for your children.) I didn't send cards, bake cookies, or feel obligated to participate in anything I didn't want to. Give yourself that permission. Those who love you will understand. In the meantime, there are others who've been through this, too, so I thought I'd share some blog posts from other military spouses who've also been down this road. Thank you, ladies, for sharing your words and wisdom with us! Kim over at She Is Fierce is one of my favorite bloggers and always worth a read. Love these posts about her personal experiences with deployments and how her family coped. For those of you spending your holidays without the one you love most in the world, I hope you know you're always remembered, always thought of, and always prayed for. You're in my heart this holiday season.